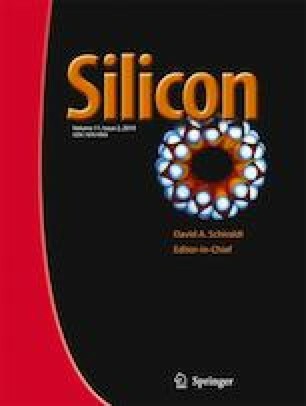 In this work, we will study the crystallization of P type hydrogenated amorphous silicon (a-Si:H) by Aluminum Induced Crystallization technique (CIA) by varying the thickness of the aluminum films. We have deposited a 100 nm thickness of p-type a-Si:H layer on Corning glass substrates using PECVD technique. An aluminum layer with thickness ranging from 10 to 400 nm was thermally evaporated on the a-Si:H surface. The thermal annealing was performed in a conventional furnace at temperature of 550 °C for 4 h in flowing N2 ambient. The study of the crystallization of the Al/a-Si:H/Glass structure according the aluminum thickness was carried out by using Raman spectroscopy, X-rays diffraction and Hall Effect measurements. Raman results reveal the presence of the peaks between 510 and 520 cm−1, which are close to the peak of crystallized Si (about 521 cm−1) proving the crystallization of all samples. The XRD measurements show the presence of the characteristic peaks of the crystalline silicon, thus the a-Si: H (p) layer was effectively crystallized by the AIC method in a short time. Through Hall measurements we found an improvement in electrical properties and an increase in dopant concentration (+ 5.3 1014 to + 2.9 1017 cm2). This work was supported by Funds National of Research: DGRSDT/MESRS (Algeria) and C.R.T.S.E Center of Research.